Mandela’s Gun had its world premiere at the Harlem International Film Festival in New York on Sunday, May 6, and walked away with three awards. 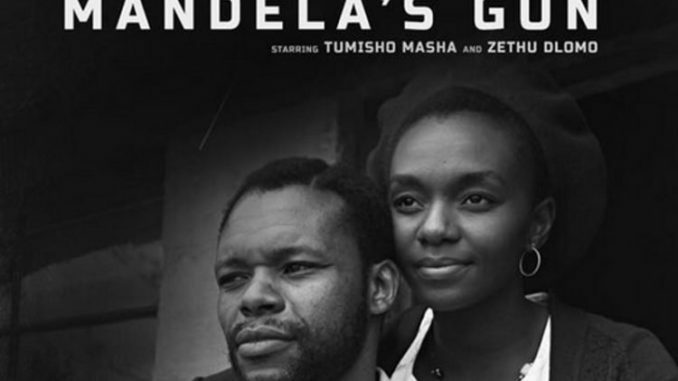 Mandela’s Gun, starring Tumisho Masha and Zethu Dlomo, is a biographical film and political thriller based on Nelson Mandela’s experience as a guerrilla fighter for the ANC in 1962, ‘as he undergoes military training in Algeria and Ethiopia, surviving assassination attempts before he was finally arrested in South Africa with the connivance of the CIA’. It explores the CIA’s role in Mandela’s arrest and imprisonment, with an exclusive testimony from a CIA agent who claims responsibility. Masha is the first local actor to play Mandela in a lead role. “This is one of the last great untold stories of the struggle. It’s the story of the first weapon of the armed struggle against apartheid – and of a Mandela who has more in common with the angry youth behind #feesmustfall than [with] the icon of reconciliation he later became,” DV8 Films producer Moroba Nkawe said. Mandela’s Gun was filmed in locations such as Cape Town, Johannesburg and London, as well as Algeria, Botswana, Ethiopia and Tanzania. Former President of South Africa and chairperson of the Liliesleaf Trust, Kgalema Motlanthe, said about Mandela’s Gun: “Hitherto, the untold revelations of a man’s commitment to a cause.” The film won three out of the four awards for which it was nominated: Best Director taken by movie director John Irvin, Best Actor Tumisho Masha and Best Original Soundtrack taken by Abdullah Ibrahim. The film also stars Nick Boraine, Luthuli Dlamini, Desmond Dube and Ashley Dowds.